Each Convey home page can be turned into a revenue generator through advertising purchases. 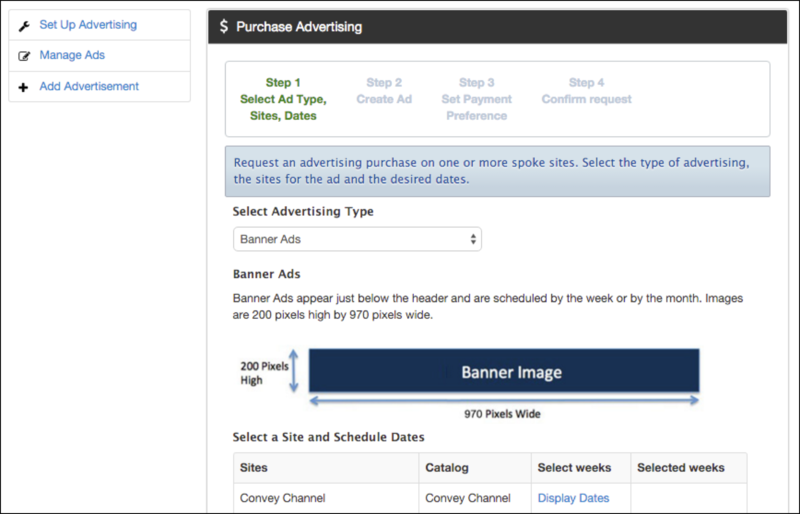 Convey's ecommerce engine allows the site owner to create custom pricing for banners, sponsored ads and feature box ads. Purchasers schedule the ad, create it, and pay for it with a credit card. The site owner is alerted to the purchase and approves the ad before it is published. Set up advertising for the site by establishing the types of ads available for purchase, the pricing for each ad, and how many ads will be allowed to run simultaneously for each position. Create an approval process before each ad can go live on the site. The automated advertising system displays a calendar of available dates for each advertisement. This makes it easy for the purchaser to see the open dates and create a schedule for advertising. The site owner can reserve dates that are not available for purchase. Users are walked through a simple set up process to create their ad. They add a headline, text, upload a file and add a hyperlink to their ad. Ads are managed by the catalog or the site owner and are approved before publication by the site owner. Convey site owners can allow advertisers using the automated system to purchase ads by credit card or let advertisers pay by invoice. The automated system allows the site owner to create custom pricing for each ad, add promotional discounts and establish a refund policy.